On May 5, 2015 the BC provincial government put the Mount Klappen anthracite coal project on hold when it transferred Fortune Minerals’ coal mine license to BC Railways. BC paid $18 million to Fortune Minerals and its partner, POSCO, the South Korean steel company. The deal suspends development in the area. The Fortune Minerals and POSCO are splitting the money 50-50, while BC is giving them the option to jointly or individually buy back the license for the same price within the next 10 years. The BC government appears to be paying Fortune Minerals to walk away from the project, which is located in the Sacred Headwaters and thereby de-fuse the conflict between the company and the Talhltan First Nation, who have steadfastly refused to allow their sacred land to be turned into an open-pit mine. BC now takes over negotiations with the Tahltan regarding future development in their territory. Re-purchase of the license will only be possible if BC and the First Nation reach an agreement that allows for coal mining. The Mount Klappen coal mine project (renamed Arctos) was owned 80% by Fortune Minerals and 20% by POSCO. Total investment in it to date has been estimated at $110 million over 30 years. POSCO bought into the project recently (July 2011), gaining its 20% interest with a $30 million upfront payment and a commitment to invest $181 million over the expected 25-year life of the project. It is interesting that Fortune Minerals got just half of the $18 million pay-off, even though it owned 80% of the project. 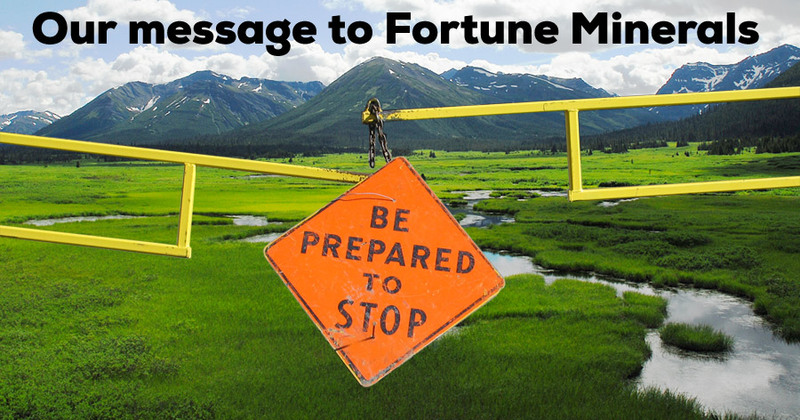 It is unlikely Fortune Minerals would be able to buy back the license if there is a BC-Tahltan development agreement before the ten-year option period expires. Its 2014 annual report shows a desperate need for money. The company plans to use the money from this week’s deal to pay down some of its debts and to run its disastrous Revenue Silver Mine in Colorado, as it attempts to meet its obligations to the New York investors financing the mine. There is speculation that with the Klappen Arctos project now in the rear-view mirror, Fortune Minerals will refocus on their NICO mine in the Northwest Territories and metals processing plant near Langham, Saskatchewan. People in these locations take heart from the Tahltan people’s success. and take warning from the suffering of other communities, such as two Yukon towns where mining companies’ promises proved worthless when they went bankrupt and left behind huge messes, unpaid bills and unpaid severance owed to laid-off workers. When a new pipeline or mine is proposed, promises are often made to communities and First Nations to win community approval. The social-licence agreements often go above and beyond what regulators require and can include increased environmental protection measures and deals to provide First Nations with job training and employment.